Does your aquarium need a timer? Which aquarium timer is best for your tank? We put this question to the test by reviewing over 19 different timers for suitability and practicality in an aquarium environment. Read on to discover our top recommendations! Why does your aquarium need a timer? What are the different types of aquarium timers? Why aren’t all aquarium timers equal? I’ll level with you. Many hobbyists don’t actually need a timer at all. However, if you find yourself turning aquarium equipment on and off at regular intervals, a timer sure beats doing it yourself. Case in point, aquarium lights. It’s no secret that too much light is a major cause of algae outbreaks. Not only that, but leaving your lights on 24/7 can cause your fish unnecessary stress – bettas, for example, like to sleep at night in darkness. So rather than turn your lights on each morning and off each night (or forget to! ), you can program a timer to automatically do this for you. Other aquarium equipment that is often controlled by a timer includes dosing pumps, CO2 injectors and UV sterilizers. 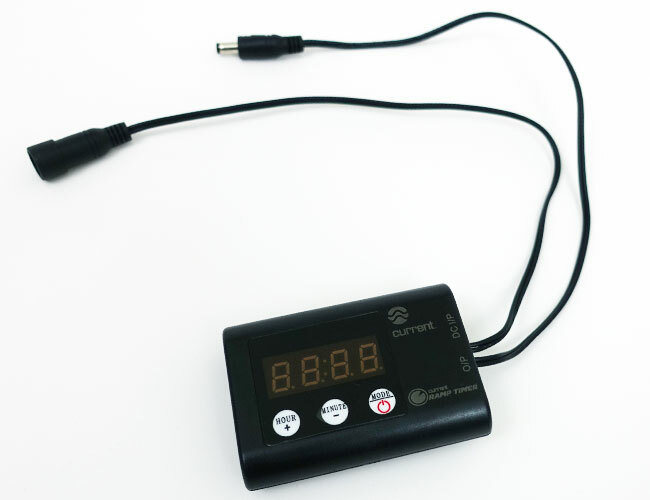 This one is the most popular type of timer used for aquariums. And for good reason! Not only is this timer readily available but darn affordable too. 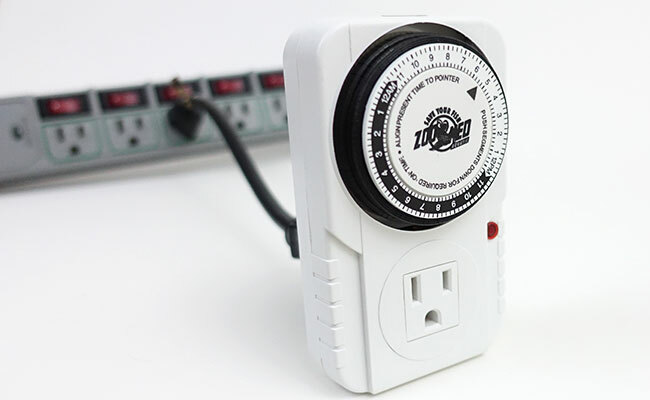 Plug this timer into your outlet or power strip, then plug your electrical equipment into your timer. All that’s left to do is program your timer so that your lights and other equipment turn on and off when you want them to. Simple, huh? The main drawback of plug-in timers is that they only work for a single product. 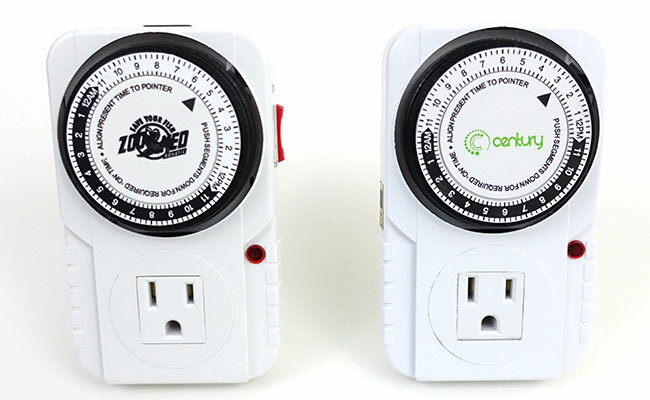 If you have two pieces of equipment that you want to switch on and off at different times, you need to buy a plug-in timer for each. Fortunately, plug-in timers are cheap to the point that this is hardly a problem. This is the timer that I will be covering in detail in today’s guide! While ramp timers are much less common, we felt that they were worth including in the guide since they are not unheard of. Rather than have your timer turn your lights on and off, wouldn’t it be cool if it could simulate a gentle sunrise or sunset for your fish? Well, a ramp timer is designed to do exactly that. Think of it as a dimmer for your aquarium lighting. 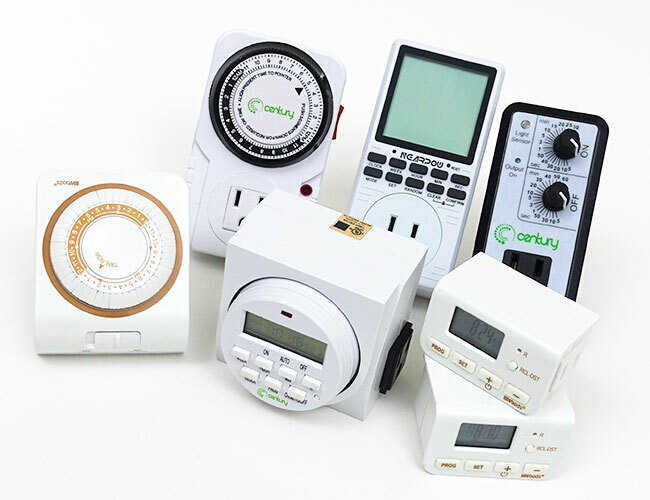 Once the timer activates, your lights will gradually begin to get brighter and brighter. The result is a more natural environment for your fish and plants. Of course, ramp timers also offer the standard “on/off” operation found on other timers. Some ramp timers even allow you to adjust the brightness of your lighting, simulate thunderstorms and more through a remote control! These days, however, most high-end aquarium lights have these features built into them. Not only that, but ramp timers often only work with certain brands and cost a pretty penny – it’s easy to see why ramp timers are not commonly used in the aquarium hobby. Looking for a good ramp timer for your aquarium? Check out the Current USA Ramp Timer Pro – one of our favorites. Your local fish store probably stocks aquarium timers. But don’t rush there just yet. It might surprise you to learn that the best aquarium timers are more likely to be sold at your local Walmart or Home Depot rather than a fish store. Well, many aquarium brands don’t actually manufacture their own timer. Let’s take the Zoo Med AquaSun. Don’t get me wrong, it works well enough. But you might be surprised to learn that it’s just a rebrand of the Century Heavy Duty 24-Hour Timer. 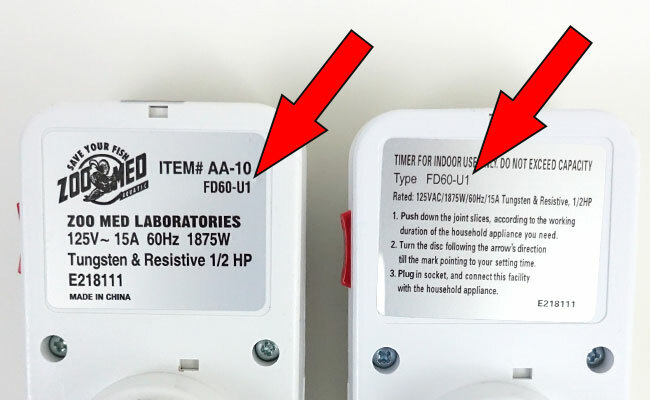 Well, flip the timer over, and you will see that both brands have the exact same model number: FD60-U1. The only difference between the two timers is that the Zoo Med AquaSun is more expensive. Sorry Zoo Med, I love you and all, but I’m not going to pay more just to have your brand name printed on my timer. Not when there are better options available. I don’t know about your tank, but for me, everything runs back to a power strip. Air pump, filter, lighting, heater – every socket on my power strip is precious. That’s why I am truly baffled that timers are power strip hogs. You see, most timers on the market are big. Too big. Even ones that are “designed” to be used with your aquarium. Check out that big boy. This timer is actually using up three of the seven outlets on the power strip. Greedy, right? This isn’t just a problem with the AquaSun. 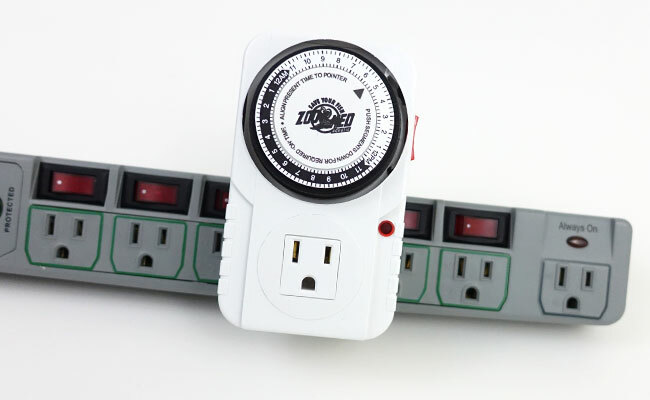 Every timer we tested obstructed the power strip’s regularly spaced outlets to some degree. You see, these timers are made to be used with wall outlets. While that’s all well and good, it means that those of us who rely on a power strip will have to sacrifice the use of a few outlets. And just like that, you have freed up the outlets that were being blocked. Clever, huh? 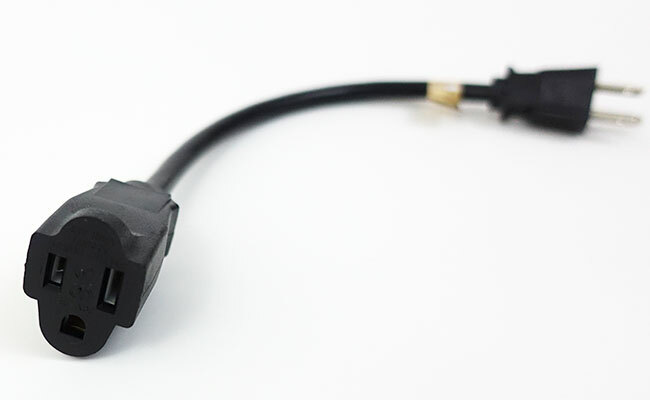 Grab this short extension cord from here. Why don’t you simply buy a power strip with a built-in timer? My main gripe with this solution is that a power strip does not have individually timed outlets. All outlets switch on or off at the same time. In my opinion, it’s easier (and often cheaper) just to buy a timer and plug it into your power strip. Looking for a good power strip? We have you covered, check out the best power strip for aquariums guide for more details. Look, I’m going to be straight up, most of you will be able to get by with a good aquarium timer from your local Home Depot or Walmart. Sure, they may be light on features, but they are cheap and do the job. Best of all, it has a child lock feature to stop young kids (or yourself!) from accidentally messing with the settings. Our only gripe is the user manual. We felt that it could have presented the instructions in an easier-to-understand manner. Even so, it didn’t take long for us to figure out how to program the timer. Maybe you just need a basic timer that turns your aquarium lights on and off once each day. If that sounds like you, then there really is no going past the Century 24-Hour Mechanical timer. By adjusting the pins either up or down, you set when you want your aquarium equipment to turn on or off, repeating every 24 hours. 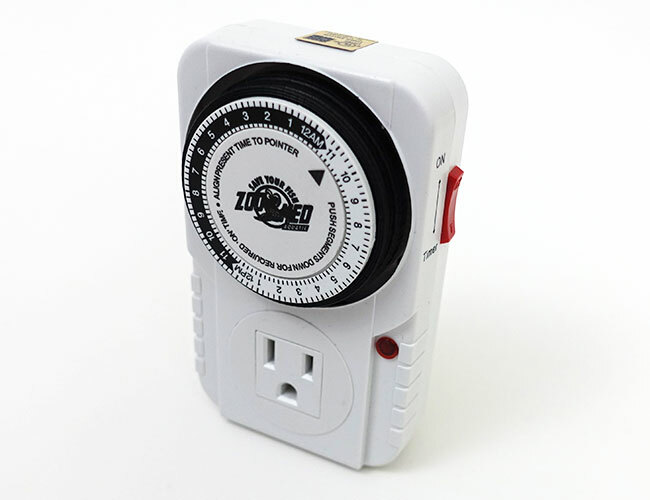 Best of all you can find this timer almost anywhere including your local hardware store. 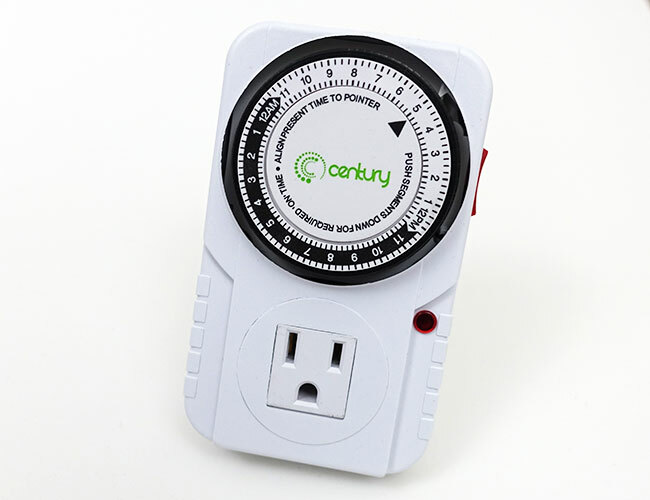 The Century 24-Hour Mechanical Timer is one of the most popular on the market and for good reason – it’s affordable and darn reliable. I’ll attest to the reliability. One of these timers has been controlling the lights over my houseplants for almost three years now. The only downside to mechanical timers is that they make a slight noise. While this is generally unnoticeable, if your fish tank sits next to your bed and you have sensitive hearing, there is a chance you will hear it. Just want an easy-to-use interval timer? It doesn’t get any more simple than this – there are only two knobs needed to adjust this timer! Let’s say you want to run your pump for one minute at a time, every half hour. This repeating timer allows you to do precisely that. Plug in your equipment and set the running time (5 seconds – 30 minutes) and the off time (5 seconds – 1 hour) and walk away. You can set the timer up so that this setting runs just for the day, night or the entire 24-hour period. The two-dial design allowed us to have the timer operating how we wanted in seconds. While you can hear a clicking sound each time the timer toggles on and off, it was hardly irritating. 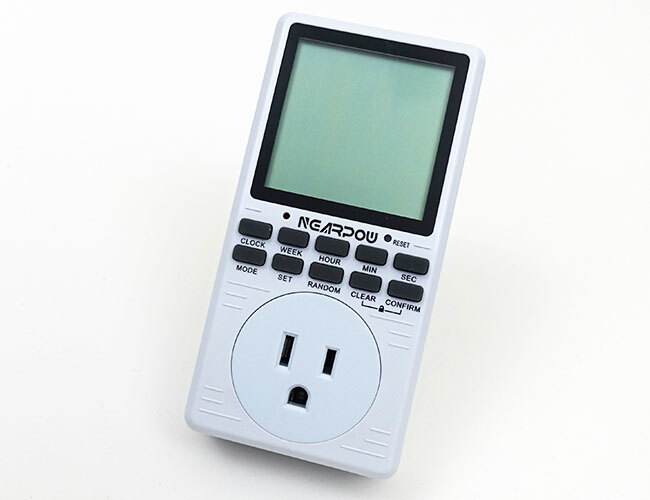 The timer uses a daylight sensor to determine whether it’s daytime or nighttime. 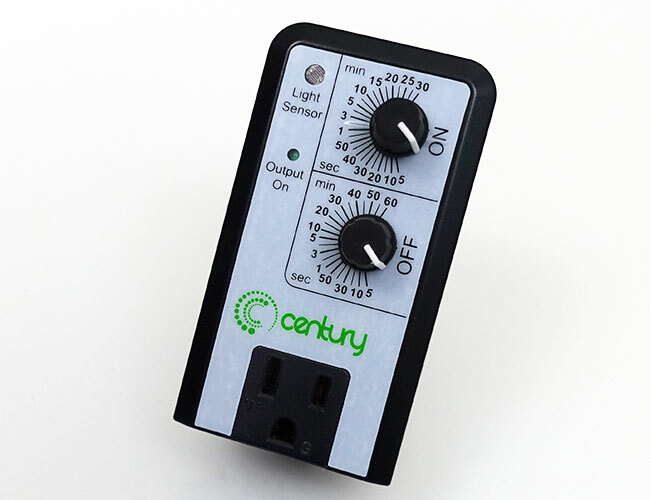 Unfortunately, if your power strip is hidden away inside the darkness of your aquarium cabinet, then this timer is always going to think it’s night time. However, this doesn’t impact its functionality as a 24-hour timer. Aside from that minor complaint, we can see how this would be a handy timer for aquarium DIYers, imagining that it would be useful for a DIY dosing pump or even used to regulate CO2 injection. While your aquarium timer sits there, doing its thing, you can rest easy knowing you won’t forget to turn your lights on or off ever again. While aquarium timers aren’t for everyone, there is no denying that they can be useful. Do you use a timer on your aquarium setup? Let me know in the comments below!